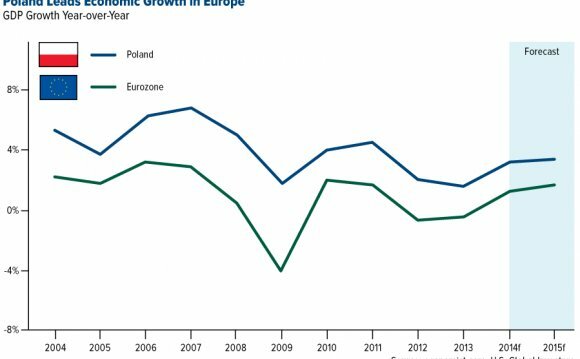 Poland’s economic growth quickened to the fastest pace in two years as record-low borrowing costs revived investment and consumer spending. Gross domestic product jumped 3.3 percent from a year earlier last quarter, compared with 2.7 percent in the previous three months, according to a preliminary estimate published today by the Central Statistical Office in Warsaw. That exceeded the 3.1 percent median estimate of 27 economists surveyed by Bloomberg. GDP rose 1.1 percent from the previous quarter. Poland is set to outperform the European Union’s largest post-communist members this year and in 2015, according to a spring forecast by the European Commission. Borrowing costs have been kept at a record low since July and policy makers have pledged to keep the key rate unchanged until at least the end of the third quarter to bolster consumer demand and investment. Fixed investment accelerated to 6.1 percent from a year earlier in the first three months and may peak at 9 percent in the final quarter of this year, according to monthly internal forecasts by the central bank cited by policy maker Andrzej Kazmierczak in a May 9 interview. Private consumption probably quickened to 2.8 percent on improved labor-market conditions and higher wages, he said. The unemployment rate fell to 13.5 percent in March from 14.3 percent a year earlier, while inflation-adjusted wages increased 3.4 percent, the most since 2008. As Poles began to spend more, the retail business of the nation’s biggest oil refiner, PKN Orlen SA, reported a record 234 million zloty ($76.6 million) of earnings before interest, taxes, depreciation and amortization in the first quarter. Sales at gas stations grew 6 percent after a 5 percent drop during the year-earlier period. Corporate and household borrowing both jumped at the fastest pace in 18 months in April, gaining 6.4 percent and 5.8 percent from a year earlier, the central bank said yesterday.